Honda Odyssey TrueDelta Reviews | Page 1 of 1 | Why Not This Car? What drives people to buy (or not buy) a certain car? 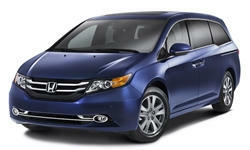 TrueDelta's members share Honda Odyssey pros and cons based on their real-world driving experiences. Minivans somehow acquired an image as the most boring vehicles. In response, many people refused to buy them, opting instead for crossovers. In response to this, some manufacturers, most notably General Motors and Ford, stopped offering minivans. The practically-minded look at fecund crossover owners and think, "What fools, they should have bought a minivan." As well-rounded and functional as crossovers have become, do these critics still have a point? What does, say, a Honda Odyssey offer that a Toyota Highlander does not?